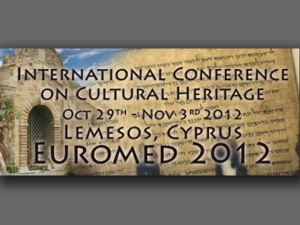 Next week the 4th International Euro-Mediterranean Conference (EuroMed 2012) opens in Cyprus. The event which runs from October 29 to November 3 will be attended by hundreds of cultural heritage professionals, researchers, policy makers and technologists from all over the world. Strategically located in the north-eastern Mediterranean, Cyprus is a stepping stone to Europe, Asia and Africa with its own rich heritage. The island’s oldest remains of civilization go back more than 13,000 years. This weekend I spoke at length with conference chair, Dr. Marinos Ioannides who has assembled a rich conference program. Ioannides who is a professor at the Cyprus University of Technology, Limassol has been scanning heritage sites since the mid 1990s and serves as Editor of the International Journal of Heritage in the Digital Era. I am particularly interested in the 3D workshop led by Ioannides and Ewald Quak from the Tallinn University of Technology, Tallinn, Estonia. I will join Eleanor Fink from the World Bank for a panel discussion on the application of Innovative Technology for the Documentation and Protection of Cultural Heritage. Leading the panel discussion will be attorney Thomas Kline from law firm Andrews Kurth and John Greaves, “Mr. RFID”, Senior Director, Orion Systems. Protecting heritage artifacts from looting is a tough problem, particularly in war-torn environments. Looting, theft and trafficking of heritage artifacts is also big business, trailing only illegal drugs and arms. Our panel will address the remedies that technology brings to this problem. Better documentation seems to be part of the answer. Which reputable organizations or individuals want to be associated with theft and ill-gotten gains? Technology can also bring some relief through the digital repatriation of objects and their historical homes. While we wait for the Britain and Greece to settle their differences about the proper home for the Elgin Marbles, we can see these objects together in the still-stunning work of Paul Debevec who combined them digitally in 2004. We have repatriated digital artworks to Marble House in Newport, Rhode Island. We can also protect sites at risk from vandalism and defacement by making the digital version available to the public. We've also had some success with the digital preservation of rock art – the downloaded versions are impervious to the threats of graffiti tags. Does this matter? Of course it does. Earlier this year I visited an Afghan official who showed me photographs of maimed Buddhist statues. Looters lopped off the statues at the knees to export them to unscrupulous collectors. I have few illusions that looting is at least as much a demand-side problem as it is a supply-side problem. Perhaps it resembles the arms trade and illegal drug trade in this way. But we can shame the Johns – individual collectors and institutions who turn a blind eye to looted goods -- if we have good documentation. Next week in Cyprus promises to be a great opportunity to connect exchange best practices with heritage documentation experts from the world over. Digital preservation for conservation and dissemination has such a bright future.